Car horns are blaring, fireworks are going off and a massive party is happening in São Paulo tonight. Palmeiras beat Vasco in Rio earlier this evening and in the process won the league with a game to spare. It was their tenth Serie A title (two more than any other team) and second win in three seasons. They may have spent tons of money, but the way Big Phil Scolari (aka Felipão) turned around the team’s fortunes after becoming their manager for the third time in August has been amazing. 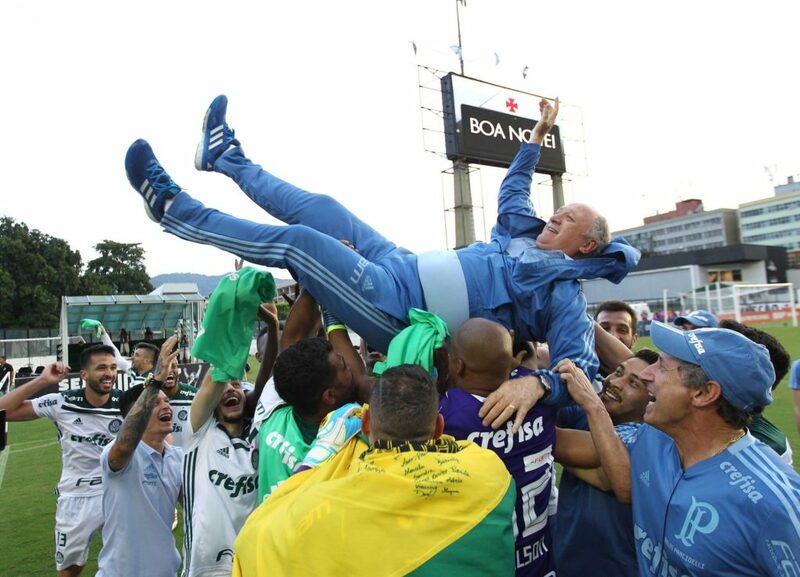 Palmeiras fans will always have a place in their hearts for Scolari after he guided the club to their first Libertadores title in 1999, but his appointment as coach for the third time earlier this year wasn’t without controversy. After leaving the club in 2000, Scolari guided Brazil to the 2002 World Cup and he also went on to have a successful career abroad. He was therefore welcomed back to Palmeiras for a second spell as their manager in 2010. That period wasn’t nearly as successful as the first stint at the club, and although they wont the Brazilian Cup, Felipão also oversaw a terrible league campaign in 2012, which ultimately led to him getting fired and Palmeiras getting relegated. That failure, coupled with his overseeing of Brazil’s disastrous 7 – 1 humiliation against Germany at the 2014 World Cup, led many, including myself, to feel that he was past his best. So, although Palmeiras fans still held him in high regard for what he had done in the past, his appointment in August this year, wasn’t unanimously popular among fans. But Scolari has made a mockery of all of those doubts now and is on the verge of achieving God like status among the Palmeiras faithful. When he took over, Palmeiras were sitting in sixth place, eight points behind the leaders Flamengo. Many felt that his predecessor Roger Machado was hastily fired, even if they admitted that he wasn’t getting the best out of his squad. But Scolari’s skillfull handling of the players has shown everybody just what the players were capable of (including themselves) and the potential of the team. Since he took over, the team are unbeaten in the league in 21 games: winning 15 and drawing 6. I’m not sure if there has even been a team in Brazil that has been so good in the second half of a season. Everybody knew that Palmeiras had some good players but the way Scolari has led them and organised the team – especially his juggling of the squad, which was competing in three competitions – has been massively impressive. The players deserve huge praise too. The best has been Dudu, who is favourite to be named the best player in the league. He may have only scored 6 goals – less than his fellow attackers Willian and Deyverson – but he has laid on a bunch of assists and is the team’s talisman. Bruno Henrique has scored eight goals in 26 starts from central midfield and deserves a special mention too. While Deyverson, who earlier this year was ridiculed for being rubbish, went on to score 9 league goals in just 11 starts (and 14 substitute appearances). He scored the winning goal today after coming on as a sub. He has limited ability, but his spirit and application have been superb this year. It is a shame for Palmeiras that they fell short in the Brazilian Cup and Copa Libertadores – both at the semi final stage – but they thoroughly deserve the league title for their consistency in the second half of the season. The likes of Gremio and Cruzeiro threw in the towel in the league to focus on the cups, but the fact that Palmeiras made a first of all three competitions speaks volumes about the quality in their squad and skills of their coach. Well done Palmeiras and Big Phil Scolari. Never miss a post by singing up for email alerts below, or follow on Facebook and Twitter. This entry was posted in Serie A and tagged Big Phil Scolari, Bruno Henrique, Deyverson, Dudu, Felipão, Luiz Felipe Scolari, Palmeiras by Brian Davidson. Bookmark the permalink. Evvai Parmera!!!! Ten is for those who have the most, so run after u! Follow the leaders. Jokes apart. Well deserved title, though I particularly don’t like this style of defensive game, exploring counter-attacks and without the ball being well worked in the middlefield. If we focus on the result, it is ok, but not even closer of what would take my breath way. We are the champtions, my friend!!! !